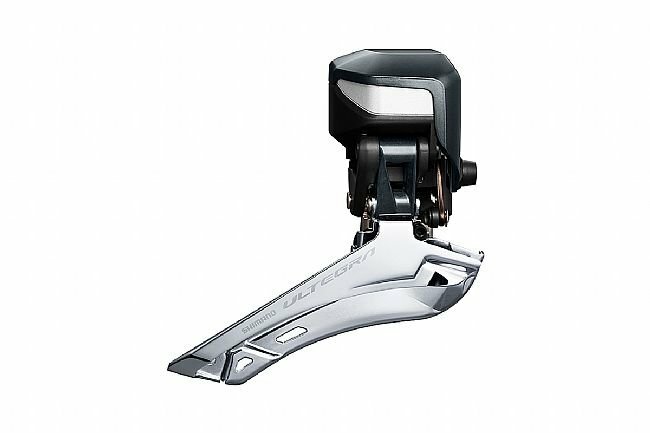 The Shimano Ultegra Di2 FD-R8050 Front Derailleur benefits from a redesign, bringing with it technology down from their top-of-the-line groupset, Dura Ace. Designed for effortlessly smooth front shifting over the more common wider gear pitches that modern bikes feature, the new Ultegra 8050 Front Derailleur brings in Shimano's Synchronized and Semi-Synchronized Shift, allowing for the optimal gearing at all times. With the Synchronized Shifting enabled, the front derailleur will automatically shift when the rear derailleur is shifted, while Semi-Synchronized Shifting works the other way, shifting the rear derailleur whenever the front is shifter. All the while, the new Di2's auto-trim feature ensures the front derailleur is always centered above the chain, avoiding chain rub through the entire range of gears. This is the first Di2 bike I have built up. BTD is a great place to get top quality products from. I highly recommend them.